(17/P91) TRENTON – The U.S. Army Corps of Engineers, in a project partnership with the Christie Administration and Trenton, will kick off a project September 22 to remove a section of culvert that carries part of the Lower Assunpink Creek under a portion of downtown Trenton, Department of Environmental Protection Commissioner Bob Martin announced today. Removing the nearly 500-foot section of box culvert will have the effect of “daylighting” the creek, meaning that a portion of the waterway will no longer run underground. 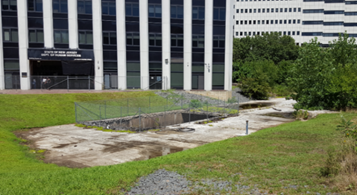 The project will stabilize and naturally align the daylighted creek with river stone, boulders and other materials; improve fish migration from the Delaware River; and create two new acres of open space for passive recreation. The Assunpink Creek was channeled into the existing culvert, and covered, in the late 1970s to make room for future redevelopment projects that ultimately never came to fruition. 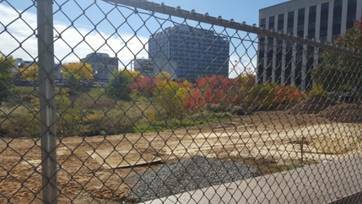 In addition to the aesthetic improvements, removal of the deteriorating culvert will also eliminate a public safety hazard. The culvert roof has failed on at least two occasions. The long-anticipated $8 million project, for which a $4.7 million contract was awarded in August, has experienced a number of setbacks over the years, from technical challenges to a critical funding gap that DEP learned of approximately a year ago. Since then, DEP’s Community Collaborative Initiative (CCI) program, which works on redevelopment projects in Trenton, Camden and Perth Amboy, brought the project partners back to the negotiating table and helped put funding mechanisms in place to move the project forward. Daylighting the stream has important implications for Trenton, Mayor Eric Jackson said. The successful bid was submitted by Boston-based Charter Contracting Company, LLC. Construction is expected to begin in the fall. The Army Corps will fund 75 percent of the project under a cost-sharing arrangement with Trenton. DEP is providing the remaining 25 percent funding to the city in support of the project through its 319(h) federal Clean Water Act grant program and from monies collected under the Natural Resource Damages program.